Be the first to share your favorite memory, photo or story of Hargus. This memorial page is dedicated for family, friends and future generations to celebrate the life of their loved one. 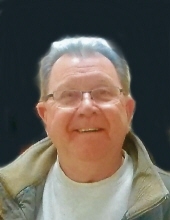 Hargus “Pop” Stidham, passed away on April 9, 2019 at the age of 76 after a hard fought battle with Multiple Myeloma. He died peacefully at this home with his best friend and wife Vicki and his children by his side. Born December 26, 1942 and a native of Brandenburg, KY, Hargus moved to Michigan as a child and as an independent teen made lots of friends cruising fast motorcycles and driving even faster cars. On April 25, 1964 he married Vicki Lynn Riblett at the Emmanuel Lutheran Church in Ypsilanti, Michigan. An only child, Hargus still fit in perfectly with Vicki’s very large family. He instantly was “one of them”. Hargus became a highly skilled and sought-after tool and die maker at Ford Motor Company for 38 years until his retirement in 2000. More importantly he was very much sought after when anything needed to be fixed at home. He could fix anything and everything, just ask his grandkids. Sometimes referred to as “The Mayor”, Hargus’ booming, resonant voice could not be mistaken as he made everybody feel special and his mere presence brightened the room and brought it and everybody in it to life. His outgoing personality fueled his sincere interest in everyone he knew and maybe more telling, everybody he didn’t know. A simple hello was never enough for Hargus. He took mental note of everyone’s name and wanted to know more about them. It wasn’t small talk, it was the real deal. Through this he forged very strong friendships with several guys and for years, sat sipping coffee and solving the world’s problems at the same table at Tim Hortons nearly every day. Hargus always had a love for the serenity of the outdoors, the wildlife, and feeding and studying the birds. That serenity led him back, as a retiree, to the golf course. He didn’t just occasionally shoot a couple rounds, he went all in. He began making clubs and studying the game like never before. His love of golf allowed him to teach some of his grandkids the game and the love of it as well. He rarely missed a high school golf match that his three golfing grandkids competed in and watched proudly when league and team awards were given. Golf also opened the door to many new friendships in retirement and even a little part-time work working the counter at the clubhouse. He took that job for free so his grandkids could practice at the “special rate”. In the fall and winter, weekly bowling with his granddaughter every Sunday in Hudson taught her the game and how to love it. He was always there to watch her high school matches and awards as well. Having six active grandkids meant lots of school and extracurricular events to get to attend. Whether it was the hard snapping of the catcher’s mitt in the summer when his grandson was striking out batters from other high schools or the quiet, precise skill his granddaughter showed in ballet recitals, Hargus stared in amazement with a big smile on his face. You would be hard pressed to find one event he and Vicki ever missed. He is preceded in death by his parents, Gordy and Bertha (Strode) Stidham and Father in-law and Mother in-law, Victor and Catherin Mary Jane (Tobin) Riblett. Hargus is survived by his wife of nearly 55 years, Vicki of Brooklyn, MI; children Kelly Welch (Michael) of Onsted, MI, Michael Stidham (Laura) of Ann Arbor, MI; Grandchildren Andrew Welch (Laura) of Ortonville, MI; Daniel Welch of Ortonville, MI; Elizabeth Stidham of Ann Arbor, MI; Claire Welch of Onsted, MI; Leah Welch of Onsted, MI; Benjamin Stidham of Ann Arbor, MI. Hargus’ family and friends will gather Friday, April 12, 2019 from 10:00 am until 1:00 pm at Borek Jennings Funeral Home, Braun Chapel where his Farewell will begin at 1:00 pm. Deacon Chris Vida will serve as celebrant. Memorial contributions are suggested to Lenawee County Humane Society or Children’s Shriner Hospital. Please leave a message of comfort for Hargus’ family at 1-877-231-7900, or sign his guestbook at www.borekjennings.com. To send flowers or a remembrance gift to the family of Hargus "Pop" Stidham, please visit our Tribute Store. "Email Address" would like to share the life celebration of Hargus "Pop" Stidham. Click on the "link" to go to share a favorite memory or leave a condolence message for the family.